The left and Bernie Sanders have been pushing for Medicare-For-All since 2016. Since that time, the movement has grown, ripples becoming waves, eventually turning to a tide. The public has long supported public health care, by huge margins. The most prominent opponents of single payer are the bought folks in Washington. In the wake of widespread public pressure, single payer has caught on: even deadset careerists (Kamala Harris, Cory Booker) and ancient hustlers (Max Baucus, who sold out single-payer under Obama) have come around. You can tell Medicare for All really might happen: the usual chorus of lobbyists and right-wingers have started to scream. It’s bad for their business, you see, that single payer healthcare might arrive in this country. You can tell: they trot out the same excuses whenever somebody proposes saving millions and millions of human beings. The most prevalent (and the dumbest) objection comes from the centrists and conservatives. 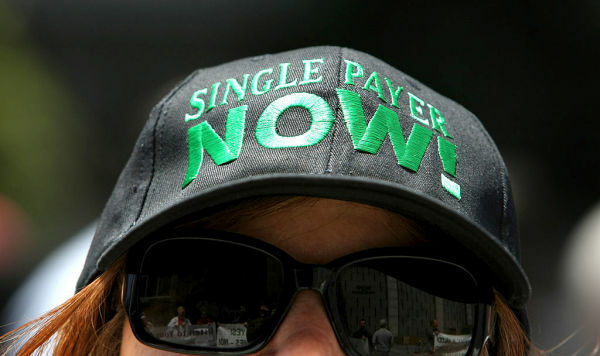 It is summed up by Chen and Weinberg’s “think”-piece in the Times: “The Sanders Single-Payer Plan Is No Miracle Cure.” Chen is a reliable backer of the one-percent’s economic interests (from the Hoover Institution), and Weinberg presides over the Economic Institute at the Bay Area Council, a discussion group led by CEOs. Both of them are long-time advocates for billionaires, so their advice can be safely thrown into the same Bay that Weinberg’s employers named themselves for. This objection doesn’t just belong to the conservatives: last year, Hillary Clinton famously said single-payer health care would “never, ever” happen. Her supporters both on and offline have compared the idea of everybody getting medical care to a pony, which shows you their moral seriousness. The “pony argument” is so slack-jawed and cynical that it ought to be laughed into oblivion. The dilemma facing us is not “our current beautiful system” versus “an impossible system.” It is between a system that does not work—that literally kills poor people—versus … oh, wait, let me check—yes, that’s correct—an actual, real system that exists IN PRACTICALLY EVERY OTHER DEVELOPED COUNTRY IN THE WORLD. We have proof it can exist. Because it does exist. We have proof it can be passed. Because it has been made the law in other lands. We have proof single-payer exists and works in other nations. We know—not feel, but know—that it saves lives and is affordable. We know it for the same reason we know scientific experiments are accurate—because they have been tried in many separate places by many different kinds of people and have been replicated successfully. Once you digest this fact—really digest it—you’ll see what Chen, Weinberg, and Clinton’s objection to single-payer actually is: a kind of moral ignorance so profound that it is almost criminal. Imagine you were an American politician researching health care: if you were seriously, honest-to-God concerned with the horrid rate at which our system bankrupts and kills sick people, then you would care enough to discover single-payer’s reality, and its effectiveness. As a politician, you would back it, even if there was no chance of it passing. You would know it could eventually happen here, because it’s happened in other countries. You would know that big visions are what drive people to the polls, to vote, to march; that people crave a cause to fight for, and single payer could be that cause. You would know that even if you don’t get to the end zone on the first try, you must still start from the strongest stance. You would know that when it comes to people’s lives, that compromise is a tool, and never a goal. The other objection—how are we going to pay for it?—is not a serious argument, and the people who make it should not be given the time of day. The Senate just gave Trump $700 billion for the military. We have spent $1 trillion—that’s Trillion, with a T—in Iraq. Single payer will cost less. Much less. When centrists and right-wingers govern, there is always money for war and bailouts, never for health care. We will pay for single payer with money, friends. That’s exactly what we’ll do. When politicians say otherwise, they are not being honest. Or perhaps they feel that bombs are a higher priority than childhood mortality. If they think this, then let them be honest about it. Folks, this is absolutely a moral question. One writer noted that “that bloated spending does something else single-payer fans would do well to grapple with: It creates jobs.” Yes. And then it kills people. Chen and Weinberg write: “Yet the United States scores much more highly on different measures, including innovation, patient-centered care and preventive health.” When you were cobbling together those jury-rigged metrics, guess what your beloved health care system did? It killed people! Yea, our health care system works in mysterious ways. It’s lying in wait for you, for you to need a rare kind of drug, so it can kill you there; it will throttle you at the pharmacy, because twenty-three percent of Americans can’t afford their prescriptions: Big Pharma has a million steak dinners to afford, after all. The medical system will get you eventually. Everyone gets sick, everyone stumbles, half of us give birth, and so the system can afford to be patient: to cheat you into debt or ease you into chronic disease. Watch out for food poisoning, cancer, AIDS, for broken bones. The health care system loves its prey, and prefers them young or old, but it doesn’t matter, it welcomes all comers. Need an epi-pen? Oh, so sad, too bad, don’t you know the price has gone up? When you need a pap smear or a rectal exam, the health care system is there, it’s watching. Here comes an ER trip, which costs you a couple of hundred, hope you’re rich. Here’s a kidney disease; you better have a job that digs dialysis. Hope you’re putting away some rainy-day cash for an insulin pump. Thank you, sir or madam, now, if you won’t mind, thirty cents of every dollar goes into administrative costs, ha ha, hope your disease is curable by envelope and paperclip. No use gnashing your teeth—they fall into disrepair because you can’t afford to go to the dentist. Gosh, do you need your fluids replenished? We’re right there—Saline drips cost $546, and the price of manufacture is 44 cents. Tell Grandma who’s howling in the night for a new hip that the replacement surgery will cost forty times more in California than it does in Oklahoma—you should probably move; but of course, that costs money too. Twenty-five percent of Americans can’t afford to go to the doctor. Eventually they don’t need a doctor at all. My elected friends in Washington, the choice is a simple one: we either give everybody health care and or we decide to dump bodies in the ground. That sounds like an exaggeration: it’s not. If health care isn’t universal, then it’s rationed: some get more than others. The way we currently ration it is by money. It is literally a matter of life and death. Politicians and journalists who oppose single payer, tear away the veil of rhetoric when you talk of cost, and be direct: money buys life. Say what you mean: everyone won’t be treated all the same. The rich literally get more life than the poor. Layer as much makeup over that fact as you like—that is the truth. That’s what we are deciding when we decide to remain with the status quo. Single payer stops that rationing. Concern trolls of universal health care, listen up. Wherever you are—in the halls of Congress, in think tanks, on the editorial page—stop setting up a false dilemma. Stop playing stupid, as if we didn’t have revenue sources to pay for it. Stop pretending what we have works. Stop distracting from the fact that our system literally chooses who lives and who dies. Just stop it, for God’s sake. We don’t need a miracle. We just need the world to work. Pass single-payer today.